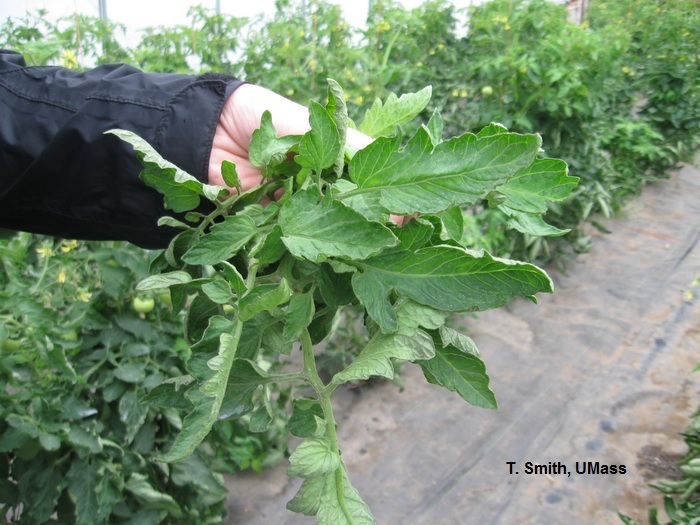 Plant tissue analysis may be used to assess the nutrient status for greenhouse vegetable and fruit crops. Once the crop is growing, plant tissue samples can be taken to monitor nutrient status. Sampling at regular intervals is useful for monitoring nutrient levels in the crop and determining whether supplemental fertilization is needed. It's a good idea to sample plants several times during the course of the growing season. Take samples even if the crop looks healthy to have a record of leaf analysis and fertility practices over time to help diagnose problems when they occur. Plant tissue samples can be tested at the UMass Extension Soil and Plant Nutrient Testing Laboratory. Information and submission forms (UMass) with guidelines for taking plant tissue samples.